COLLARD GREENS: dark-green, flat, large leaf. May be substituted for kale or other hearty greens recipes. Use large leaf rolled up as a wrap and stuff with vegetables or hummus. See Week 12 for usage and storage information. Black-stemmed Peppermint–superior fragrance and flavor; forest green leaves with deep purple veins and stems, purple flowers; leaves are good as a hot or iced tea, and adds a delicious flavor when minced and added to cooked peas, carrots, potatoes, salads, and fresh strawberries. Italian Flat-leaf Parsley—flat, glossy, dark green leaves have a strong parsley/celery flavor for use dried or fresh; especially good in omelets, scrambled eggs, mashed potatoes, soups, pasta and vegetable dishes, as well as, sauces to go with fish, poultry, & pork. ONIONS (Zephyr): purple-red skinned onion with sweet flavor. See Week 10 for usage and storage information. HOT PEPPERS: You will receive Poblano (black-green chili pepper, heart-shaped fruit, which is mildly pungent with a lightly sweet, medium-hot flavor). See Week 12 newsletter for usage and storage information. SWEET PEPPERS: You will receive Carmen (6 inch long, tapered fruit that ripens from green to a deep “carmine” red; sweet taste in salads and when roasted and fully red-ripe) and Sweet Sunrise (medium-large, blocky, yellow-orange pepper; fruity, sweet flavor), or Red Knight Bell (big, blocky, thick-walled, green-to-red pepper with sweet flesh). See Week 16 for usage and storage information. RADISHES: You will receive Pink Beauty (pink-colored root with mild, spicy flavor). See Week 14 for usage and storage information. SALAD MIX: a mix of baby greens—arugula, tatsoi, Napa cabbage, spicy greens mix, baby lettuces. See Week 1 for storage and usage information. TOMATOES: You will receive: Juliet (deep red, plum tomato; good in salads, salsa sauce) and Striped German (very large, meaty, 1-2 lb. fruit with red-yellow stripes and dense, juicy, red-yellow streaked flesh; excellent sweet, complex flavors). Just throw the tomatoes into freezer bags after cutting off spots or core, if you want to store them for the winter. See Week 9 for storage and usage information. WINTER SQUASH: You will all receive Butternut (light, tan-colored skin; small seed cavities with thick, cylindrical necks; bright orange, moist, sweet flesh; longest storage potential of all squash). You may also choose between Sweet Dumpling (small 4-inch diameter, coloring is like the “Delicata”, but round, flat-topped shape; makes a great bowl for stuffing with rice, breading, or soups) or Delicata (small, oblong, creamy colored with long green stripes, only slightly ribbed; pale yellow, sweet flesh; edible skin; best eaten within 4 months of harvest). See Week 17 for usage and storage information. 4. THANKS FOR COMING TO OUR FALL WORK PARTY AND POTLUCK on Sept. 22. We managed to weed in the herb garden, fill about 10 jars with dried herbs, harvest 12 crates of potatoes, cleaned/clipped 20 crates of onions, and filled our bellies full of delicious food. All members were able to go home with a squash or a pumpkin, a pint of raspberries, and a flower bouquet if they wanted. On top of this we were musically inspired with a little Jazz, African, Latin, Middle Eastern, Salsa, Country, and Funk by a trio from “the Dorkestra”. Thanks Tim, Kip, and Dave! 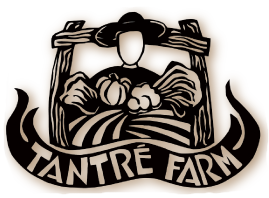 We really appreciate getting to know so many of our Tantre Farm community and especially all the ways you all pitch in to help the farm. 5. BAGS, BAGS, BAGS!! We still could use some if you have some, but only grocery size please, NOT bread bags or small sizes. 6. HARVEST AT THE FARM: Please call ahead if you plan to pick on other days besides Farm Distribution Days (Wed. and Fri.), so we can make sure someone is around to help you. U-pick Flowers—This week you may pick 1 bouquet of up to 20 stems for “free” as part of your share. You may want to bring a vase or a jar to keep your flowers fresher on the ride home! Bring carrots, stock or water, salt (and potato if desired) to a boil. Cover and simmer 12-15 minutes. Let cool to room temperature. Sauté the onion, garlic and nuts in 3-4 Tbsp. Butter and with a little salt, until onions are clear. Purée everything together in a blender, until it is smooth. Return the purée to a kettle or double boiler and whisk in ONE of the following: 1 cup milk, 1 cup yogurt or buttermilk plus a little honey, ½ pint heavy cream, ¾ cup sour cream. Season with ONE of the following combinations:2 pinches nutmeg, ½ tsp. dried mint, dash of cinnamon OR ½ to 1 tsp. thyme, marjoram, and basil OR 1 tsp. freshly grated ginger root, sautéed in butter plus a dash of sherry before serving. For another variation add the carrot greens to cook before puréeing. This adds a burst of nutrition and a variation in flavor that is a nice change. THEN garnish with grated apple or toasted nuts or sour cream. Cut squash in half lengthwise; remove seeds. Place face down on oiled baking sheet; bake at 350 degrees for 1 hour. While squash is baking, sauté apples and onions in butter. Add remaining ingredients to apples. Stuff squash with mixture, covered, 15-20 minutes. 1/2 to 1 pound pasta: orecchiette, penne, fusilli, etc. Roast red peppers, then place in a Ziploc bag to allow to sweat. Peel the charred skins from the peppers, then removed seeds. Set aside. Lightly toast pine nuts in a skillet. Set aside. Puree peppers with pine nuts. Set aside. Cook pasta according to package directions. In a skillet or pot over medium heat, drizzle in olive oil. Add diced onions and garlic and cook until soft. Pour in pepper puree and stir together. Add plenty of salt. Pour in cream and stir to combine. Taste and add more salt, if necessary. Add cooked pasta, and then stir together. Place pasta into a bowl, top with chopped parsley and plenty of shaved Parmesan cheese. Cut delicata squash in half lengthwise and remove the seeds and pulp. Slice these halves into ½ to 1-inch “half moons” crosswise. Toss with olive oil and salt and lay out on baking sheet. Roast at 350 degrees for 15 minutes or until edges of squash start browning or caramelizing. This is so delicious when the squash is roasted long enough, so that it just melts in your mouth. Very easy and well worth trying!